NICK’S Window Cleaning offer a variety of tailor-made and customizable window maintenance plans for both homes and businesses, being sure to provide the most convenient and professional Etobicoke window cleaning service. We strive to create programs that help our clients have the best looking windows possible, all while fitting within their budgets and schedules. Broadly speaking, our services can be broken down into two categories: business and residential. There are specific advantages for using our services in both areas, and benefits that come with getting your windows professionally cleaned. The most obvious benefits include saving you the hassle of cleaning them yourself, and having a professional who will do the work so you can focus on other, more important things. Window cleaning is a convenient and professional service that many people need. The advantages are many and varied, from cleaner and clearer windows to saving you both time and money. If you need professional, courteous, and affordable window cleaning in Etobicoke, you can trust NICK’S Window Cleaning. We’ve been providing window cleaning in Toronto for many years, our high-quality service is tailor-made to your specific needs and expectations. Timely service. Commercial window cleaning is available six days a week and during almost any time of day. So whether you need window cleaning first thing in the morning or some time during the weekend, our professional cleaners can be there when you need them most. Interior & Exterior cleaning. NICK’S Window Cleaning provide fast, efficient, and friendly window cleaning services whenever you need, this includes cleaning both the inside and outside of your windows so that they are as clean as possible. Having professionals clean your home’s windows yields plenty of benefits. Increased Curb Appeal. Whether or not you are selling your home, clean windows make your home look and feel better. People will feel more welcome from the moment they see your home. NICK’S Window Cleaning takes the safety of our staff and clients very seriously. Besides being trained in the safest ways to clean windows, and being equipped with the right tools to do their job properly, we ensure that all of our workers are insured and bonded. You can trust that when you hire our window cleaners in Etobicoke that you’re receiving the best possible service and have full peace of mind knowing our team and your property is covered. Professional window cleaning services are a key aspect of presenting a clean and well-organized business. Clean windows instill confidence in potential customers and warm the hearts of visitors to your home. Clean windows provide homes with plenty of natural light, all of which can be increased with professional cleaning services. Our cleaners use quality products that provide a crystal clear finish, so your home can get better light during the day. Replacing windows is expensive, which is why proper and regular maintenance is the much better route. Professional window cleaning can actually extend the life of your windows, helping them stay strong and effective for years longer than windows that are unkempt and dirty. NICK’S Window Cleaning is your top-choice for professionally clean windows in the Etobicoke area. We service both commercial and residential properties up to a maximum height of 3 storeys. Our window cleaning services includes the option to clean both interior and exterior of your windows, so your windows look their absolute best. 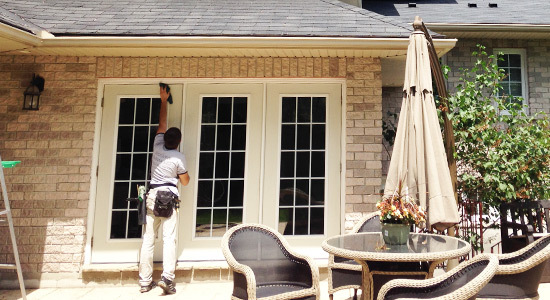 Our service is one of Etobicoke’s finest, cleaning your windows is what we do best but we also believe our business is providing top-notch customer service and building strong relationships with our customers. We do this by going the extra-mile to ensure your job looks great and working with you to ensure all of your expectations are met. Should you have any questions about our service please contact us today for a free no-obligation quote, we’re confident that once you try our service you’ll be calling us back again. Accidents in the home are one of the most common ways that people injure themselves. Cleaning windows is one of the most frequent causes of home related injuries. That’s because homeowners usually don’t have the knowledge or experience to stay safe when they are cleaning windows. Using tall ladders can be dangerous. Trying to scrub grime off an outdoor window while perched on a ladder is even more dangerous. Some things, like window cleaning, are better left to professionals. Window cleaners have the experience and the equipment necessary to safely clean windows even on higher floors. How long do you think it would take you to clean all the windows on your home? Multiply that number by two and that’s probably closer to how long it will take. Wouldn’t you rather spend your weekends or your vacation doing something fun with your family and friends instead of struggling in the heat to try and safely clean all the windows on your home? A professional window cleaning service can get the job done much more quickly than you can and you can spend all that extra time relaxing or doing something that you enjoy doing. One of the biggest reasons that homeowners should let professionals clean their windows is the potential for damage to the windows. There are a hundred ways that you can damage your windows while trying to clean them. They could crack, chip or even shatter if not cleaned the right way. There could also be damage to the window frame or damage to the house. Replacing windows is a lot tougher and more expensive than hiring a professional window cleaner. If you want to be sure that your windows get cleaned without any damage to your windows or your home hire professionals to get the job done. They will get your window sparkling fast without any risk to you and without any damage that you need to fix.